The Ellen Pao-Kleiner Perkins trial shone a light on discrimination in the tech industry, but for a more immediate look at the challenges women face in corporate America, look no further than a Google Images search. 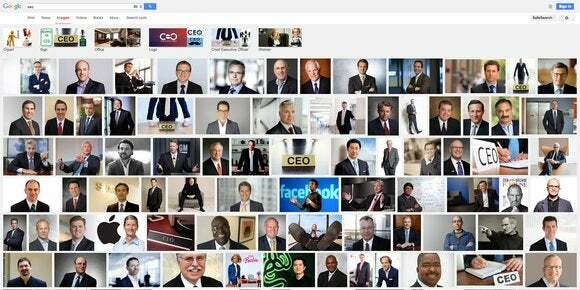 Doing a search at the site for “CEO” reveals just one female face in the top results: CEO Barbie. The doll (which may not even be a real Barbie product) appears way down in the results, under a sea of male, mostly white faces. It’s not really the fault of Google, whose algorithms in many ways reflect the pervasive culture: Most of the top images labeled CEO at popular sites apparently are men. But it’s an indication of how under-represented woman are at the top of the corporate ladder. Nor is Google alone in its results, noticed earlier by The Verge. Search for “CEO” on Bing and the service offers to refine your search to “women CEO”—using the same picture of Barbie. Much lower down, Bing shows an image of former Burberry CEO Angela Ahrendts. The results offer a glimpse into a male-dominated corporate culture, but they are also skewed against women. For the aforementioned Google search, 11 percent of the faces depicted in the top 100 results are women, but 27 percent of U.S. CEOs are female, according to researchers at the University of Washington, who published results of a study on the issue Thursday. It works the other way, too. Do a Google Images search for “telemarketer,” and women dominate the top results, even though that occupation is split evenly between men and women, the researchers said. The search results aren’t inconsequential, according to the study: They influence how people view the real world. “In a few jobs—including CEO—women were significantly underrepresented in Google image search results ... and that can change searchers’ worldviews,” the researchers said.